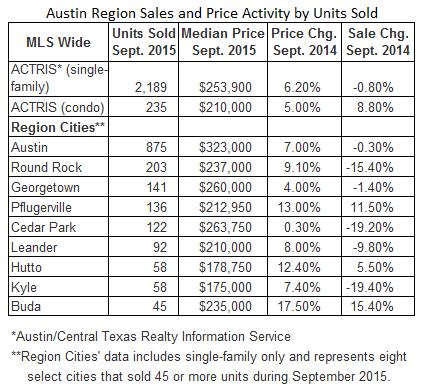 ​​​​​​​​AUSTIN-ROUND ROCK - The Austin Board of Realtors has released home sales facts for September 2015. The median price of existing single-family homes decreased to $253,900, down 4.2 percent from August 2015. Existing single-family home sales decreased 15.9 percent from August 2015 for a September 2015 total of 2,189 sold units. Condos decreased in price to $210,000, down 0.5 percent from August 2015.